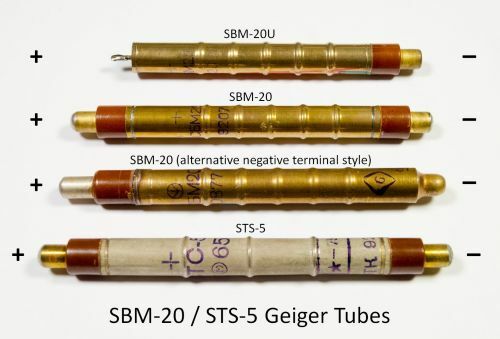 The picture above shows a variety of Geiger tubes that are commonly sold under the name “SBM-20”. This post is an attempt to clear up some of the confusion around these tubes and to share some information about the different tube styles I have encountered in the wild since I first started selling Geiger Counter kits in 2011. This is my spotter’s guide to the SBM-20 Geiger counter tube. This is the quintessential Soviet Geiger Counter tube. 400V operating voltage. 105mm overall length. Gold (brass?) color. Symmetric end caps. Positive terminal is usually marked ‘+’, but if not, it’s the end closest to the CBM-20 marking. Date codes are always four digit, but I have seen both MMYY and YYMM (assuming I am interpreting the numbers correctly). Year of manufacture varies widely but most are 1970s – 1990s. Very common alternate version of the SBM-20. Shorter 95mm overall length. Positive terminal is exposed rod with no end cap. Soldering to this terminal can be a challenge as the plating is usually quite oxidized and the underlying metal is steel. I’ve also seen the internal glass seals fail after soldering. These are often sold as SBM-20 tubes, and unscrupulous eBay sellers will sell the SBM-20/SBM-20U interchangeably. Slightly longer positive terminal. 105mm overall length. Negative terminal is formed from the tube body (cost saving design?). Tubes I have seen are marked ’77’, presumably date code for 1977. Rare. Older version of the SBM-20. Slightly longer overall length, approx. 110mm. Silver color. Positive terminal is marked + and closest to the CTC-5 marking. Date codes I have seen are mid-1960s through 1970s. I haven’t confirmed this, but I suspect date code is roman numeral month followed by arabic numeral year, eg. VIII 65. Aside from longer overall length, properties and performance are very similar to SBM-20. Less common than SBM-20, presumably because they are older and were not manufactured in great numbers across as many years. Sometimes sold under the name SBM-20. They are generally interchangeable with “real” SBM-20 tubes, but given that they are significantly older, failure rate might be higher (unconfirmed). My Geiger Counter kit will accommodate the STS-5 and all of the SBM-20 variants shown. The SBM-20U requires a short jumper wire to connect the positive terminal to the PCB. I recommend using an alligator clip or wrapping a wire around the terminal to avoid compromising the glass to metal seal with the heat of the solder.